The amount of space baby is taking up will have the biggest impact on your physical changes in the seventh month of pregnancy. See what to expect as you learn to deal with your continually growing body. Throughout your pregnancy, as you already know, blood volume steadily increases to accommodate the body’s increasing need for oxygen and nourishment. By the seventh month of pregnancy you have forty-five percent more blood than you started with. Your heart has to work harder to pump this extra fluid; your heart rate increases by around ten beats per minute and the heart pumps about thirty percent more blood with each beat. These changes peak during mid-pregnancy when you may be able to feel your heart working harder; many women feel “heart-pounding” sensations during the second half of pregnancy, especially when they exercise or change position suddenly. 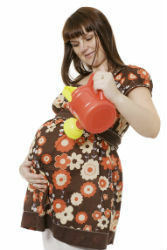 The heart’s occasional pounding is a normal response to the major circulatory changes that take place during pregnancy. Yet, it is also a signal that your heart, at the moment, is working too hard. The more fit you are, the better your heart adjusts to the extra demands of pregnancy. If the pounding increases noticeably during exercise, slow down. Rise from lying to sitting, or from sitting to standing more slowly. These heart-pounding sensations will disappear within a few weeks after birth, as your heart rate slows and your circulatory system returns to its pre-pregnant state. During pregnancy the circulatory system, like the respiratory system, is incredibly efficient, ensuring that both you and your baby receive the extra-oxygenated blood you need. Your lung capacity increases, and you may actually add a few inches to the size of your rib cage. While you may notice that you breathe slightly faster while pregnant, you may not know that you are breathing more efficiently, exhaling and inhaling more air during each breath. At times during your pregnancy you may feel short of breath. These feelings of breathlessness do not mean that you or your baby is lacking oxygen. It just means there is less room for your lungs to expand and your body is protesting this aggravation a bit. Most of the time you are not even conscious that you are breathing more deeply, but sometimes you may catch yourself sighing, which is another way, your body helps you take an extra deep breath. Don’t worry if you wake up in the morning with a swollen face, especially the eyelids. The normal facial puffiness of that often appears around the seventh month of pregnancy is due to the accumulation of extra fluid beneath thin tissue. During the day gravity usually drains the face of this extra fluid. Unless puffy eyelids are accompanied by rapid weight gain and excessive swelling all over your body, just accept the swelling as another of pregnancy’s harmless changes in your body. The combination of your unwieldy body, relaxed ligaments and forgetful mind may cause you to stumble on curb corners, trip over toys or drop your fork in the middle of a meal. Your ungraceful gait cannot be entirely attributed to the 20 or more pounds you have gained. Your waddle and your klutziness are also a result of the loose and waterlogged ligaments in your hand, pelvic and leg joints. Realize that you have temporarily lost your nimbleness in both feet and fingers and be extra cautious. Pay more attention, for example, when using scissors, lifting a hot skillet or carrying a toddler down steps. The nightly “kick fest” continues. Studies show babies kick most frequently during the seventh month of pregnancy and kick more often in the night and early morning hours (from midnight to six a.m.). Of course, babies’ limbs are longer and stronger now, so the punches are more powerful. Don’t worry that those periodic, annoying jabs in the ribs might get worse in the months to come. The increasingly crowded living conditions in the womb will soon take some of the leverage out of baby’s punches. Studies have shown that babies move less in the final two months than they do during the seventh month of pregnancy. Besides the kicks and shiftings you love to feel (though not necessarily at 3 a.m.), you may notice fetal hiccups in the seventh month of pregnancy – short, spasmodic blips in your lower abdomen. Hiccups are usually short-lived, so by the time you’ve hollered for your mate to “come feel this” and he finally gets there, they will probably have stopped. Hiccups often occur around the same time each day, so you may be able to catch another performance soon. These sudden new twitches may take you by surprise, but they don’t bother baby, and most mothers just think they feel funny.